A few minutes before the scheduled 1 p.m. meeting of the Sylvan Hearth Pagan Temple Sunday (Sept. 7) in Poteet Park, Sylva Police Chief Jeff Jamison instructed street preacher Dean Moore to put away his megaphone and “Jesus Saves” sandwich board. 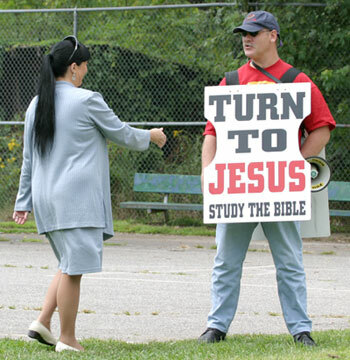 He also asked the few protestors who showed up at the park to turn off the Christian music blaring from a car stereo. These two actions marked the beginning of Jamison’s hour-long negotiations between Moore, the protesters and Lianna Costantino-Cardon, high priestess of the pagan organization. “I’m here to preach the gospel,” said Moore, member of the Street Preachers Fellowship and a leader of the N.C. Bible Believers, another street preaching group. “Freedom of speech is my right under the Constitution. I’ve stepped outside their permitted meeting area, but I will continue to preach the word of Jesus Christ,” he said. For the remainder of the hour, Moore paced the park with Bible in hand, preaching loudly. A handful of other protesters, unrelated to Moore, sat or stood near the playground and watched the proceedings. Two other police officers accompanied Jamison in the park, a scene that remained primarily peaceful. Earlier in the week, Costantino-Cardon met with Jamison and town attorney Eric Ridenour to discuss the legality of meeting in Poteet Park, one of Sylva’s public spaces. Citing freedom of worship and freedom of assembly, Costantino-Cardon paid the fee and secured a meeting permit to use the park’s covered shelter from 1-2 p.m.
Temple members planned on using the Sunday gathering to discuss future plans for a campus pagan group with students from Western Carolina University. No worship activities had been scheduled for the afternoon, Costantino-Cardon said. About half the dozen people who came to the pagan meeting left within 30 minutes, saying Moore’s preaching and the presence of the press made it difficult for them to meet. They relocated to an undisclosed spot to continue. “People get murdered, people lose their jobs over things like this,” said one group member who chose to remain unidentified. The members of the group who remained at the park discussed upcoming plans. First on Costantino-Cardon’s agenda was to address concerns brought to Sylva Town Board members Sept. 4 by the Rev. Larry Perry, pastor of Tuckasegee Baptist Church. During a period of public comment, Perry presented information on pagan groups that Costantino-Cardon says is inaccurate. “He printed something from a Web site that is not ours. He claimed things about us that are not true. So I’m going to speak about those misconceptions at the October town board meeting,” she said. One of the biggest misconceptions, says Costantino-Cardon, is that the group intends to attract local teenagers. “We don’t believe in proselytizing,” she said. Costantino-Cardon is also considering whether to take legal action against the city after the Sunday event, claiming town officers failed to enforce state criminal statutes that prevent disturbance of a religious meeting. “I will be taking issue with my attorney about this,” she said. Costantino-Cardon and her husband, Palugo Cardon, moved to the Sylva area from Colorado a month ago to establish a local branch of the Sylvan Hearth Pagan Temple, which already includes five groups around the country. Pelugo Cardon serves as the group’s high priest. Long before coming to Jackson County, “Sylvan” has been part of the temple’s name because the word means “inhabiting the forest.” One of the most important elements of pagan worship is its connection to nature, the two said. In addition to the temple and the student group at WCU, Costantino-Cardon said she would like to purchase property for a seminary and interfaith community similar to ones she led in Colorado.